Kitchen makeovers have become popular in recent year. Avoiding the expense and interruption caused from installing a brand new kitchen, replacing warn cupboard doors, kitchen counter and kitchen cupboard handles transforms your kitchen in to a space that will be the envy of all those who visit. It’s not to say that remodelling is for everyone, and if the base units and appliances are shot then perhaps a new kitchen is the best way forward, but if repair and improvement is possible then the following tips will help you make the right decisions along the way. 1) Contemporary kitchens look best with flat panel high gloss laminated doors. Available in a selection of vibrant colours, check that the colour will suit the other elements of your kitchen and home décor. 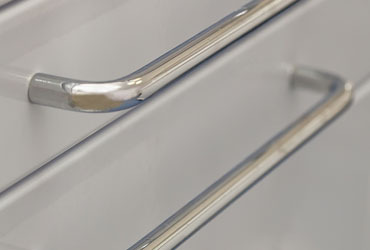 2) Ultra-modern kitchen units aren’t complete without contemporary kitchen cupboard handles, t-bar, bow or designer kitchen cupboard handles in polished or brushed chrome finish will look superb. 3) Traditional and European style kitchen cupboards look best with old world cupboard door handles. Cup handles, brass pulls and glass knobs work well. 4) Consider the surrounding finishes, from light fixings and appliances to wall and floor tiles and their colours. A match isn’t necessary but finishes that complement each other will help create an attractive space. 5) Just about all kitchen handle styles will suit painted and wooden cupboard doors, from stainless steel and polished chrome to brass which has also started to make a comeback. 6) For best results, coordinate the cupboard handles with your appliance finishes. An exact match isn’t always possible but the closer the finishes are the better. 7) If your cupboard hinges are visible from the sides of the cupboard then if possible match the handle finish to keep a cohesive hardware finish. 8) When selecting remodelling hardware for your kitchen, what’s most important is to select items that will suit and work with your home styles, appliances and fixtures. You may find our article on how to drill ceramic tiles helpful during remodelling your kitchen.